Trust the Marines to have their stuff squared away. Very few people are aware that, despite the IRS lowering the threshold for what charitable contributions require receipts to $0, there is an exception if the method does not enable providing a receipt, and the example specifically given is a dropbox. 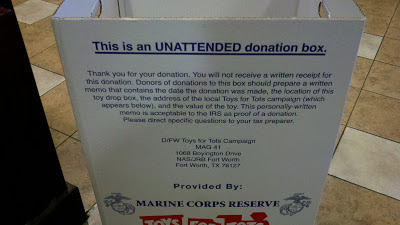 I snapped this picture of a Marine Corps Toys for Tots dropbox in Dallas, TX that succinctly summarizes how to substantiate a donation made to a dropbox.